And Now You Will Too!" "How Does This "Swing Wizard" From Texas Quickly Transform Dribbling Ground Balls Into SCORCHING Line Drives... And Weak Pop Flies Into TOWERING Moon Shots?" How? Well The Answer Is A Stunningly Simple "6-Ball Hitting Method" … That's Actually EASY To Do (Once You See How It's Done)… Can Be Learned Quickly… And Is 100% Guaranteed To Work For You And Your Team! This is the ONE Secret To An Easy… Comfortable… Almost EFFORTLESS Swing That's Loaded With Huge Payloads Of Raw "Wrecking-Ball" Power And Astonishing Bat Speed. For Gorgeous Cannon-Shot Line Drives To All Fields! I'm here to tell you that your days of frustration and humiliation are over. That's right, no more watching your girls swing like a wild chimpanzee and miss the ball by a mile. No more embarrassing strikeouts with the game on the line. And no more pitiful outings where your team barely gets on base. This is the secret to how the best hitters in the world… hitters like Crystl Bustos and Albert Pujols… consistently stroke the ball with such jaw-dropping power, and make it look so darn easy. Because this is your best chance to boost your team's batting average, score more runs, and put your squad light years ahead of your competition. Here's how you'll get there. You'll discover it all fast and without fuss in a new online video clinic called "The 6 Ball Hitting Method." Your instructor is Guy Simmons, a nationally recognized clinic speaker and one of the country's top hitting coaches. To say that he's becoming one of the most sought-after and influential hot-shot coaches on the planet is an understatement (to say the least). This "Swing Wizard" from Texas has a special knack for breaking down nitty-gritty hitting mechanics and explaining them in a clear, "No B.S." way that coaches and players LOVE. It's why his 6-Ball Method has been spreading like wildfire, and why he's becoming one of the most sought-after and influential convention speakers on the planet. Last year alone, state coaching associations from Texas to Missouri to Ohio all beat down his door, and practically begged him to give up his "6-Ball" secret to their private members (who paid up to $110 a pop for the privilege). You won't have to travel halfway across the country, or attend some over-priced coaching clinic to learn the 6-Ball Method for yourself. Because today, you can get instant access to Coach Guy, right over your computer screen, at any time of day or night, from anywhere in the world with an Internet connection! The 6 Ball Method is a unique approach to swing mechanics that literally forces your hitters to keep the bat inside the hitting zone - and on the plane of the ball - for up to six times longer than a traditional swing. Master this simple technique (it doesn't take long) and your hitters will see a sudden and dramatic improvement in their performance at the plate. With your bat in the hitting zone for so long, timing becomes less of an issue. If you swing too early (anticipating a fastball and getting a changeup), or too late (anticipating a changeup and getting a fastball), your bat-head is still right on the plane of the ball. And instead of whiffing on the pitch, or making weak contact, you catch the ball right on the sweet spot of the bat. Dribbling ground balls become scorching line drives. And weak pop flies become towering moon shots. The best part is how EASY this system is to implement with your team. Every phase of the "6-Ball" swing is explained with step by step instructions and live video demos. There's absolutely no guesswork on your part. Plus, you'll learn dozens of useful tips, drills and coaching pointers along the way. 3 critical points to remember when gripping the bat, and why some traditional advice (like "lining up the knuckles") can be safely ignored! One simple "alignment trick" used by every great hitter in history, from Babe Ruth to A-Rod. Learn an easy, no-brainer method for teaching it to your athletes. Why "getting the elbow up" is a TERRIBLE piece of advice… and exactly what you SHOULD be telling your hitters about hand and elbow position instead. The best way to teach the "trigger" phase to your team. It trains your players to become their OWN best hitting coach… for rapid, stunning improvements you'll have to see to believe! How to "fire the back hip" into the swing - for a more explosive turn... hypersonic bat speed, and more barrel control! The "full extension" myth that actually ROBS power out of your hitter's swing. How to finish the swing without "rolling off the ball." This one small change transforms lazy pop files into screaming line drives! How to simulate a change-up using a clever little "Drop Drill." Helps your athletes recover and still make solid contact, even if they're "fooled" on the speed of the pitch. A "Quick 10 Toss" drill that reinforces the 6-ball swing path, while dramatically improving your hitter's bat speed and reaction time! How to train your hitters to transfer their energy THROUGH the ball at contact, with a fun "Bounce-Hit" drill. Start nailing down this method for yourself - which will happen FAST - and you'll be hit upside the head with a huge "a-ha" experience. It's a beautiful thing to finally "get" the one secret to effortless power and consistency at the plate. What's even better is that this'll work for any hitter - tall, short, skinny, heavy, Little League, varsity, or college. Here's where it really gets good. You can implement the 6-Ball swing with any style of hitting too… whether you coach fastpitch or softball... believe in the rotational method or the linear method... the 6-Ball Method will work for you and your athletes. Or I'll Pay For It Out Of My Own Pocket! That's right! You can test drive this online clinic for a full 60 days with no risk whatsoever. Simply watch the videos, try out the tips and drills, and see if they work for you. If you're not seeing a HUGE improvement in your team's performance at the plate, just let me know and I'll send you a full 100% refund with no questions asked! Well, just for the sake of comparison, a typical hitting lesson will run you between $80 to $120 an hour. And it's a one-shot deal... you'd better remember what was taught... or you're back out there the following week, shelling out another handful of 20's. The beauty of this online video clinic is how simple it is to use. You can stream the videos over your Internet connection or watch them on your iPhone, iPad or other mobile device. You can even bring them into practice and show the techniques directly to your players! It's easy. No special skills or fancy software required. 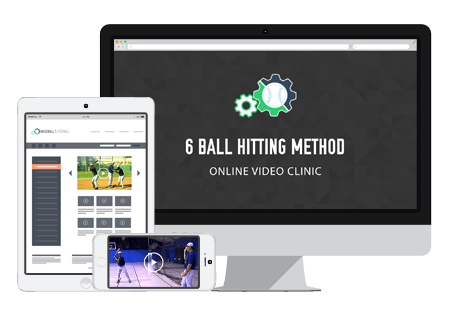 If you can watch a video on Youtube, then you have everything you need to get started with "The 6-Ball Hitting Method" right now. Bottom Line: once you're in, you're IN. Registering for this online clinic today gets you complete lifetime access to all the material with no restrictions or time limits. And you can get everything today, for just $19! An incredible bargain that's only good for this part of the season. Click the orange Add to Cart button below now to place your secure order. You'll get instant access as soon as your order is complete. PS - Still not sure? Ok, let's take this up a notch. If you try out the online clinic and aren't 100% blown away with the results you see, you can have your entire payment back. And... on top of that... I'll let you pick any hitting resource from my catalog and have it for FREE. No questions asked. No funny business. No wiggle clauses. Why would I make such a generous offer? Because I know how much these tips will HELP you. I know how much more FUN you'll have coaching your hitters. And I know how much BETTER your team will play after you introduce these simple concepts. I know that 99.9% of the folks in our community are honest. I know you'll give this online clinic the honest shot it deserves... and you'll be so impressed with the results, it'll be the best investment you'll make all season! So go ahead and click the Add to Cart button below now and get started today!